I left the Garden parking lot after finishing Big Slide feeling good and the day was warming up so I made my way over to the Loj parking area to get started on the second half of the day, Street and Nye. I stopped for breakfast in town to refuel and made it to the Loj at around 11:15. Unfortunately for me it was a busy day at the Loj and I was forced to park down the road below the bridge and walk back up the hill to the trailhead. This added some extra distance but I didn’t mind too much. I made it up the road in no time and hit the trail headed towards Heart Lake and Mt. Jo. Despite these being my 43 and 44 peak I had never actually taken the time to walk over to Heart Lake which is truly an oversight on my part. It is a beautiful place to see and have a seat to enjoy the view and relax. It is also incredibly easy to reach so I can see why it would be so popular. 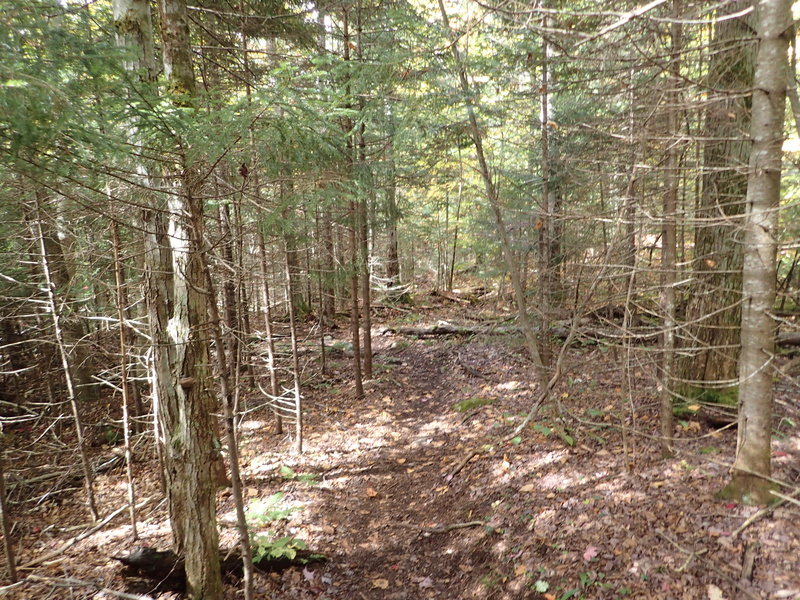 After taking a few minutes to enjoy the view I continued on down the flat and well maintained trail. After a few minutes I hit the trail register and after signing in continued on my way. 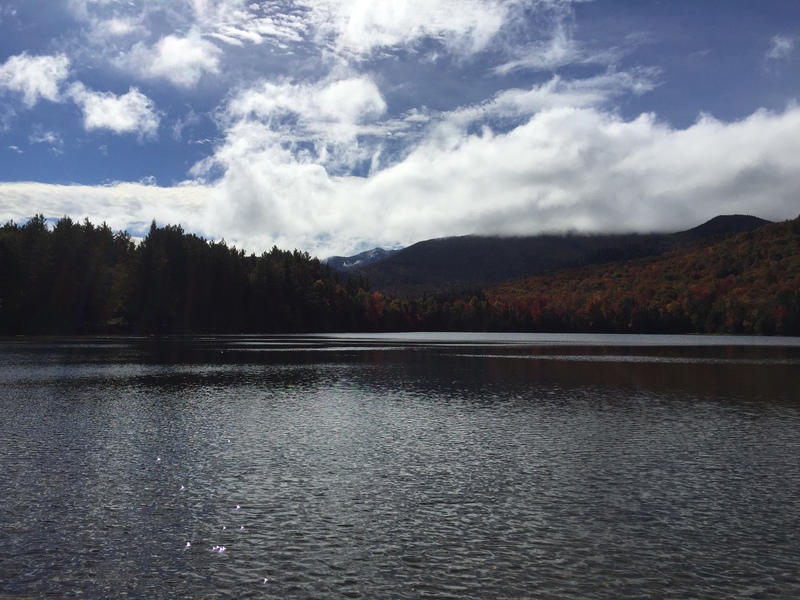 It is at this point that I should have been paying closer attention because instead of turning down the proper trail towards my objectives, which is right on the other side of the lake from where I started, I just kept on walking. 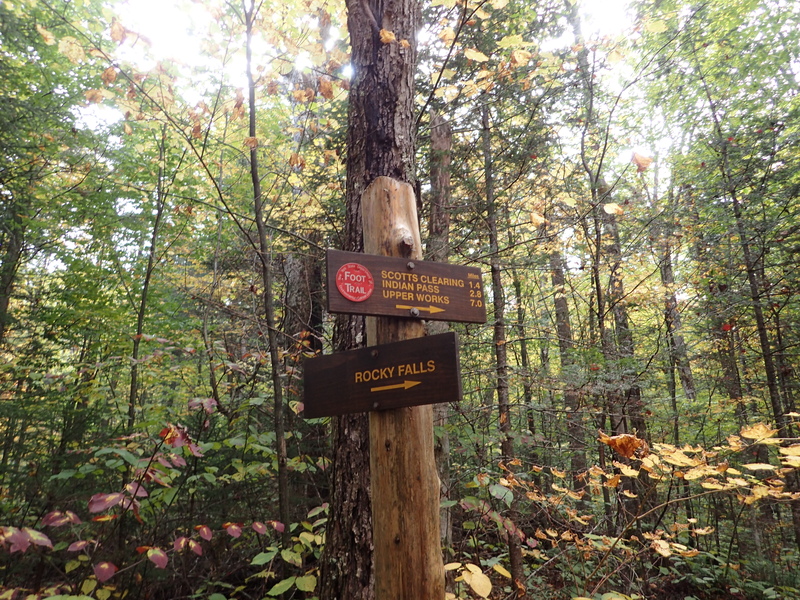 Having gotten used to doing a lot of long hikes I didn’t think much of it until I suddenly found myself staring at the sign for the trail junction for Rocky Falls. It was at this point that I realized I had been walking 2 miles in the wrong direction! If you hit this junction you have gone entirely the wrong way! In retrospect I should have just done the 0.3 mile loop around Rocky Falls since I had already gone most of the way but since I was a bit angry at myself I simply turned around and made my way back towards the proper trail. I made it back to the correct junction at 12:31 and luckily hadn’t lost too much time with my navigation debacle. The correct trail you want to turn on for Street and Nye. After turning down the correct trail it is only a short jaunt until you reach the start of the herd path for Street and Nye. 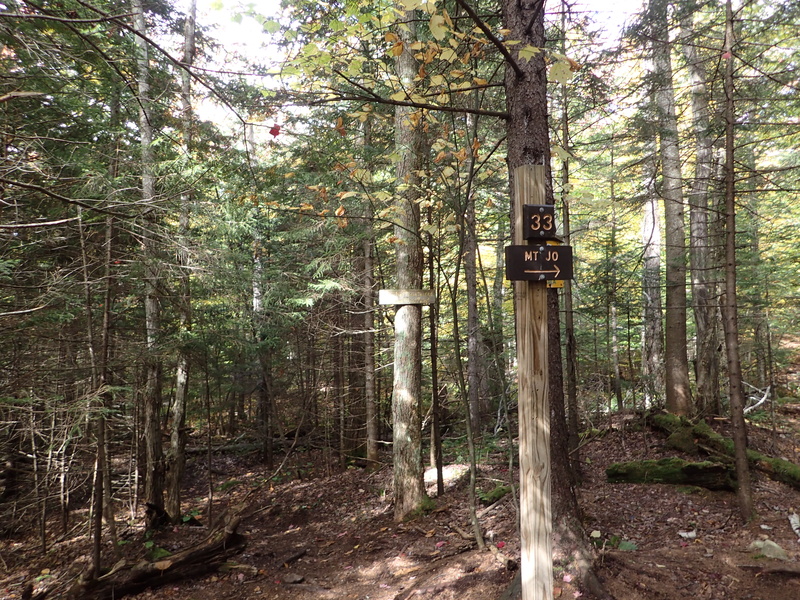 The start is easy to find as there is an additional sign marking the way either to Mt Jo or onto the non maintained herd path. Junction for the start of the herd path. Additional sign letting you know your going the right way. The trail from here winds its way along an easy trail as you make your way down to Indian Pass Brook. The herd path was easy to follow but I could see it being an issue in winter if there is heavy snow cover and no one had tracked it out ahead of you, but that is a potential challenge for another day! The herd path leading to Indian Brook. 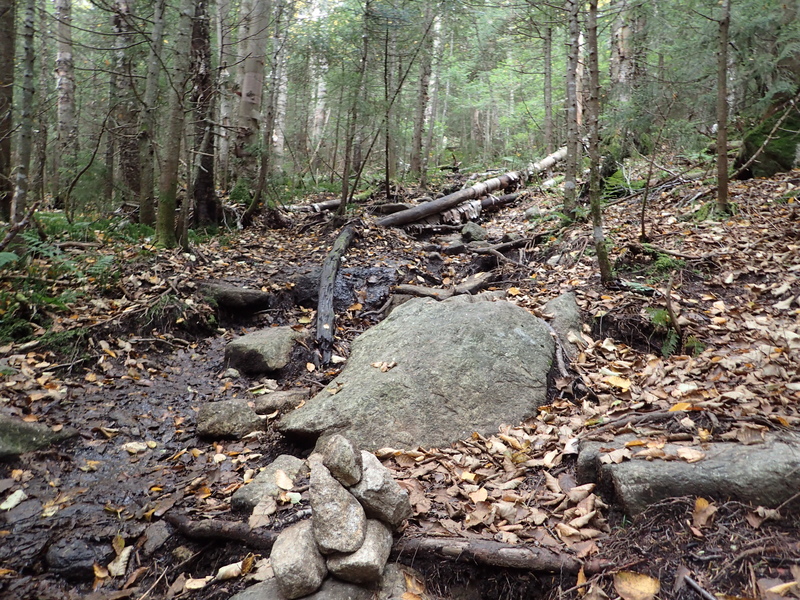 This section of the trail didn’t take me too long to tackle and before I knew it I was down at the Brook itself. Once I reached the Brook I did not see any obvious dry crossings so I decided to simply take off my shoes and go for an icy walk through the water. Luckily there wasn’t much water to cross but I prefer to have wet feet on purpose rather than by accident. 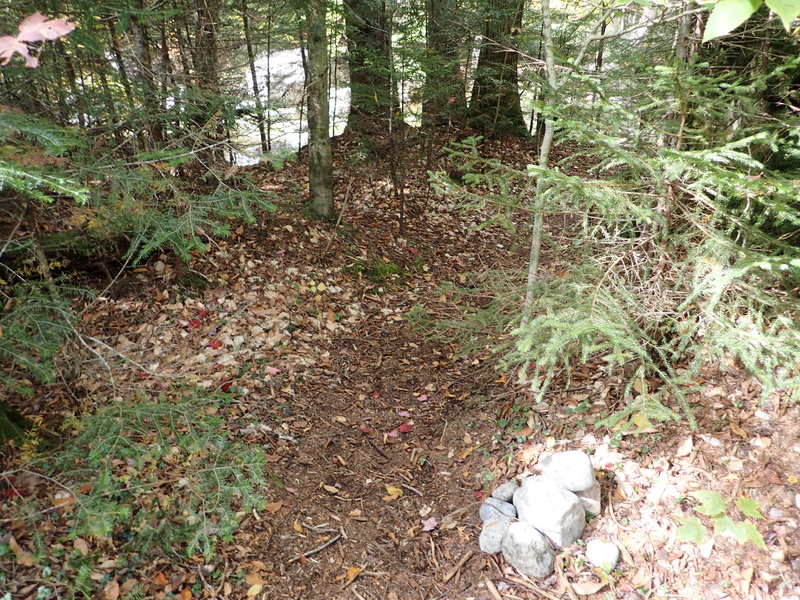 A convenient cairn marks the location of the crossing as well as multiple cairns on the opposite bank. Cairn marking the way to the water crossing. Cairns marking where you meet the trail on the other side. As a side note I did hear from folks I passed on the way down that if you go further up the river around the bend there is a place to cross without getting your feet wet. However, they did mention something about a giant wasp nest which sounded thoroughly unpleasant so instead of wasting time looking for a dry crossing I simply went for a dip on my way out as well. 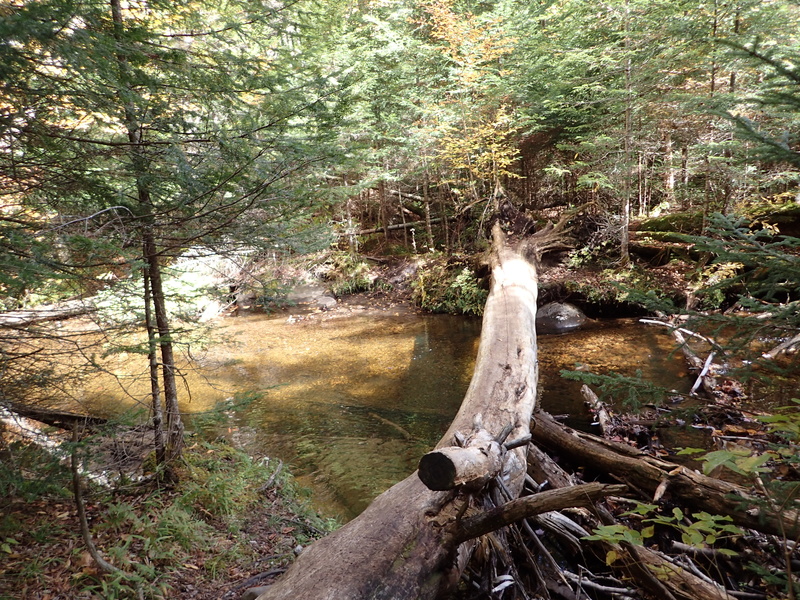 After crossing over Indian Pass Brook I came to another small brook crossing which conveniently had a large fallen tree as a bridge. Log bridge over the second water crossing. 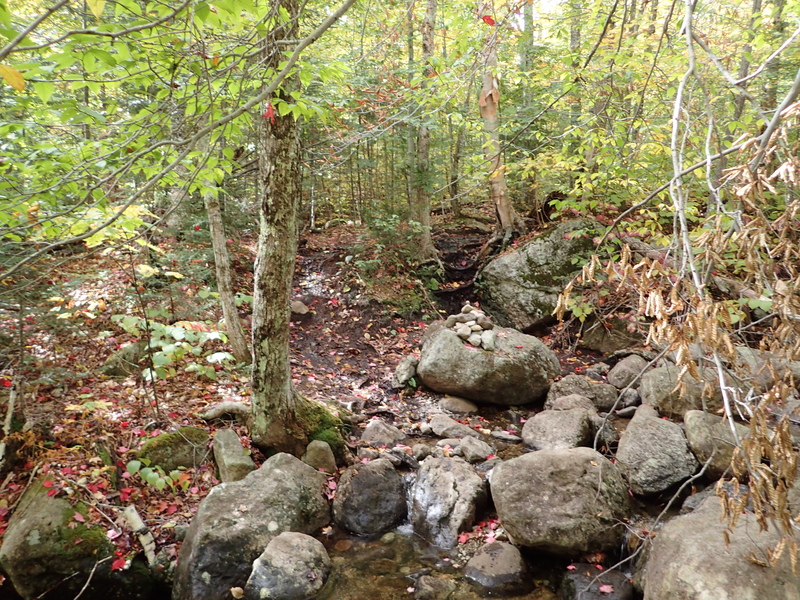 After crossing the second small brook I began to start gaining elevation as I made my way up the wet and muddy route along the smaller brook coming off the mountainside. The trail was fairly well traveled so it wasn’t terribly hard to follow but do be mindful to keep an eye out for the various cairns along the way. Start of the muddy and wet trail up the mountain. The hiking from this point is pretty but otherwise not very exciting. I maintained a steady pace and made good time as I weaved my way up the mountain. At this point I had also not seen anyone else since I started so it felt like I had the wilderness to myself which was nice but it did also make me feel at times like I must not be going in the right direction. 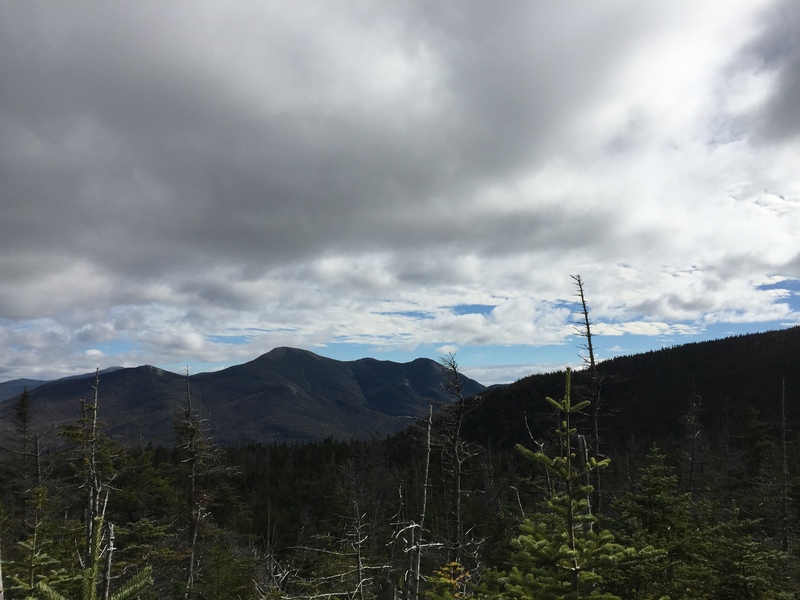 Despite my feelings I knew I was going the right way as I passed the various cairns and enjoyed the change in vegetation as I made my way up to the higher elevations. Cairn marking the way on the muddy trail. As you get closer to the top you make one last fairly steep climb up on to the ridge before reaching a small clearing on the ridge which marks the split for Street and Nye. I have read in other trip reports that this used to be a bit of a confusing mess to find the correct trail but as it stands now I found it to be incredibly straight forward. 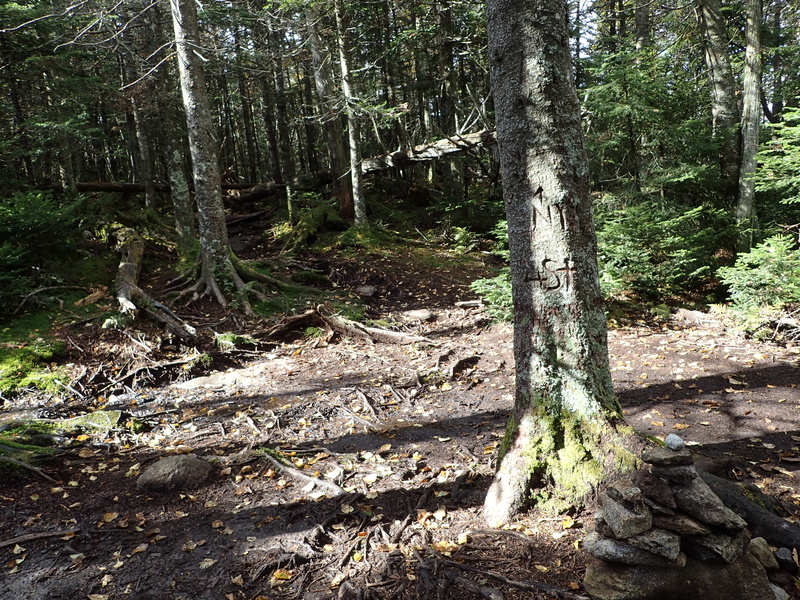 A tree also marks the way to each summit. Tree in the small clearing marking the split for the individual Street and Nye summit trails. From this point it is 0.6 miles to the summit of Street and 0.3 miles to the summit of Nye. Since Street was the longer trail and taller summit I decided to start there. I kept a quick pace and made quick progress up the trail. 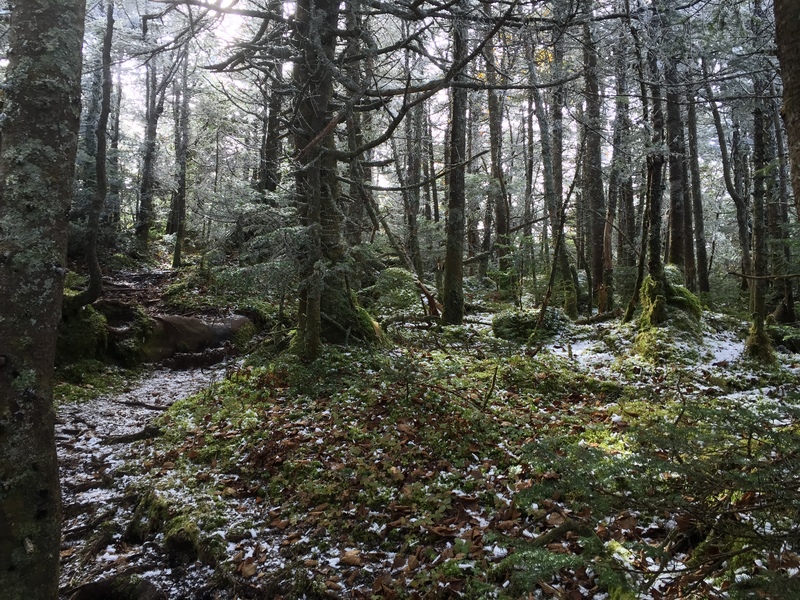 As I got closer to the summit I was also greeted by some light ice/snow cover which had blown off the trees. 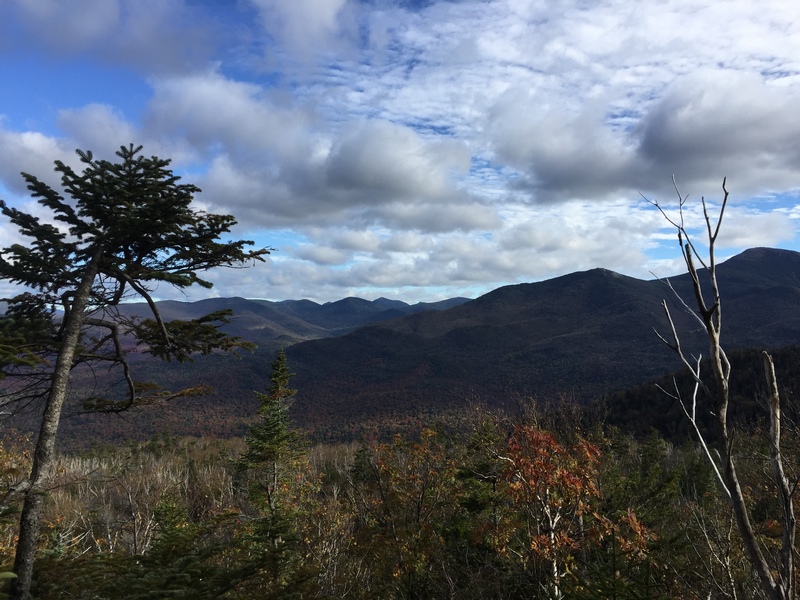 Winter is coming to the High Peaks and seeing the landscape in transition at higher elevations so early into Fall is quite beautiful. 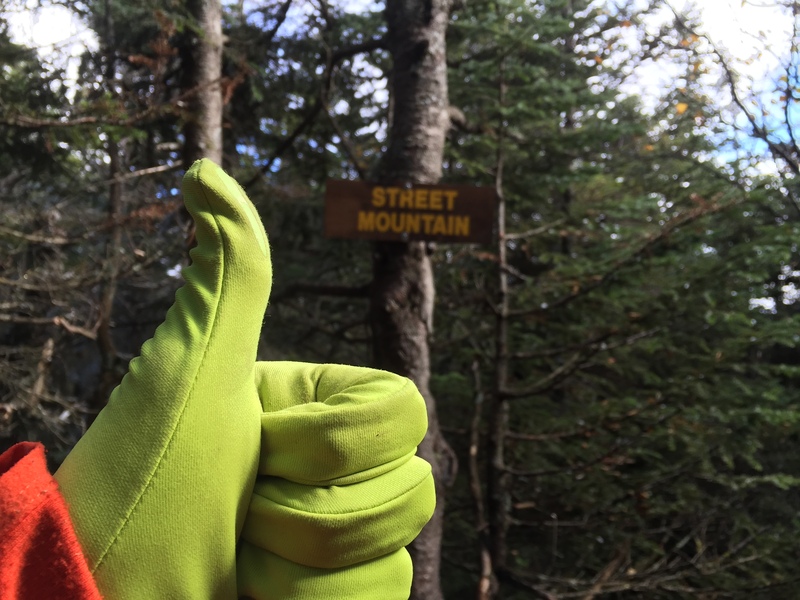 I made it on to the summit of Street at 2:33 which is marked by a sign. 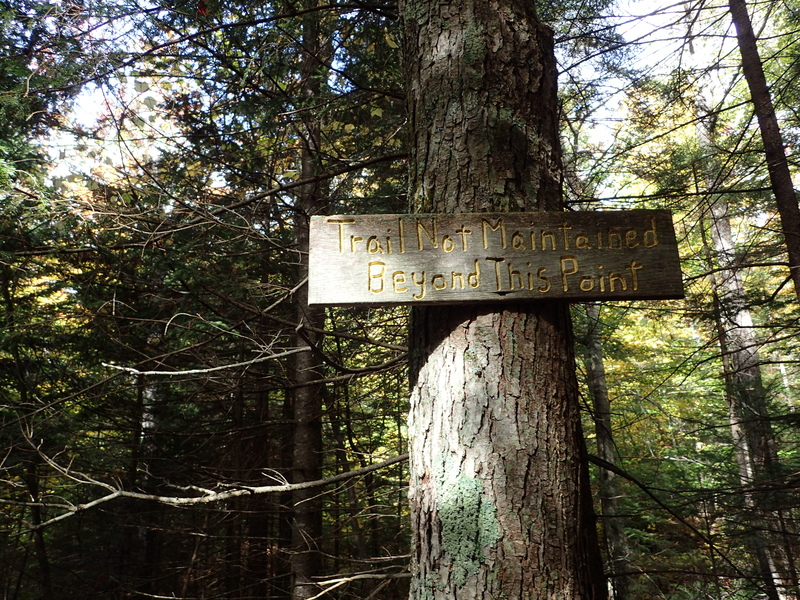 The summit itself is fully wooded but there are some obstructed views from small look outs surrounding the summit. Since it was a bit cold on top I only stayed long enough to take a photo before continuing on my way back down to Nye. 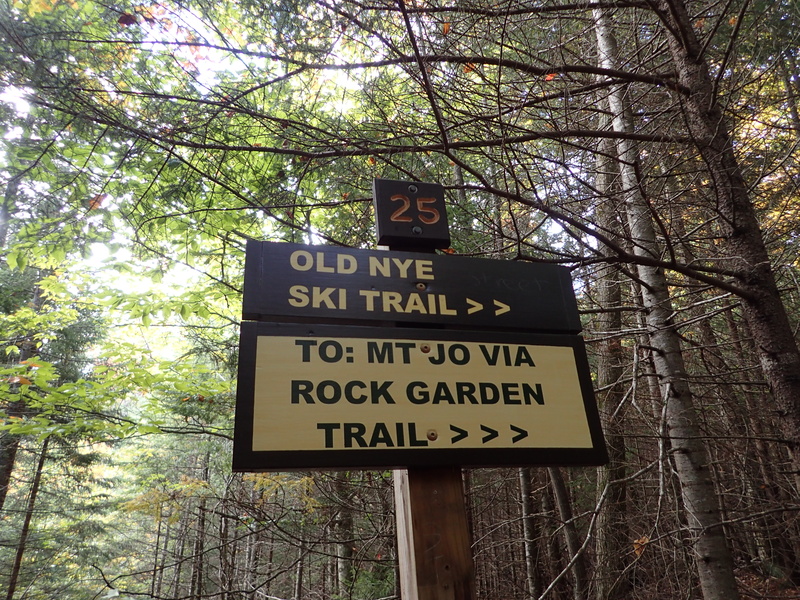 I made quick work of the trail back to the junction and didn’t waste any time before turning down the trail to Nye. This particular stretch of trail is mostly flat and it felt like it only 5-10 minutes before I was standing on the summit of Nye. This summit is also completely wooded and offered even less in the way of views than Street did. However, since it didn’t really take much extra effort to climb there isn’t too much to get upset about. 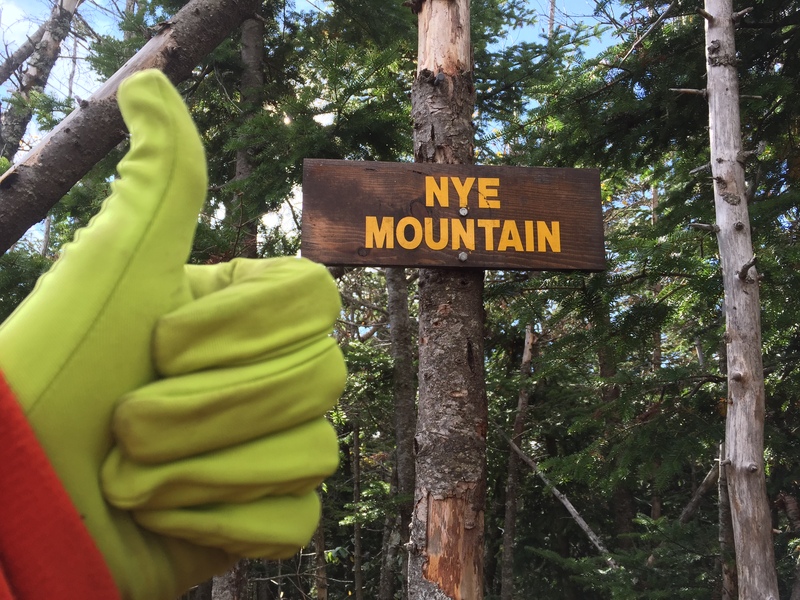 I was on the summit of Nye at 3:00 which put me at 44/46 peaks! On the way down from Street I was also able to snap the semi obstructed photos below of the surrounding summits. Views I got from near the top of Street and Nye. After leaving the summit of Nye I didn’t waste much time before getting back down the mountain. The way back down was pretty uneventful and just consisted of just trying not to fall on the wet and muddy trail along the small brook. 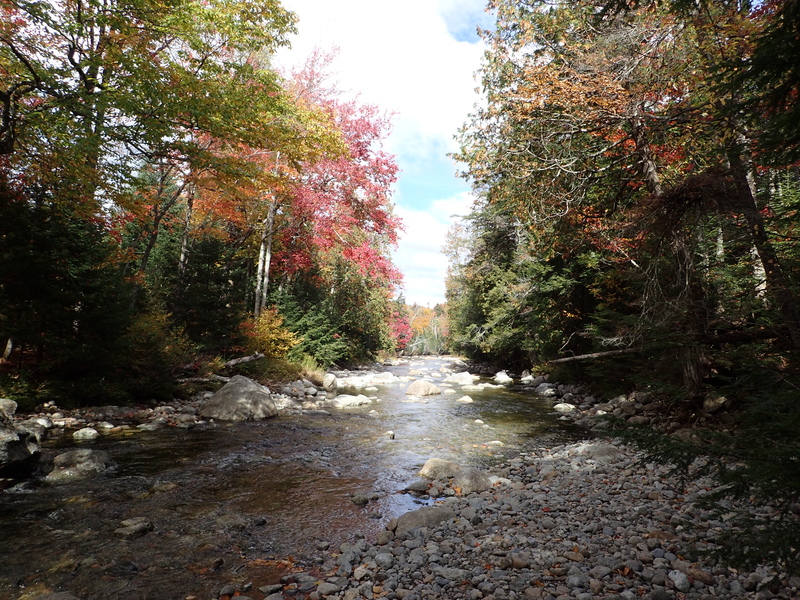 When I reached Indian Pass Brook I took my shoes off again and made a nice chilly walk back across the water. At this point in the day after doing Big Slide, Street, Nye, and my detour it felt nice to cool off my feet in the icy water. I signed out at the register along the way and made it back to the trail head on the road at 4:44. Street and Nye were certainly not my favorite peaks and I do not think I will be back to do them again any time soon but they also weren’t my least favorite. 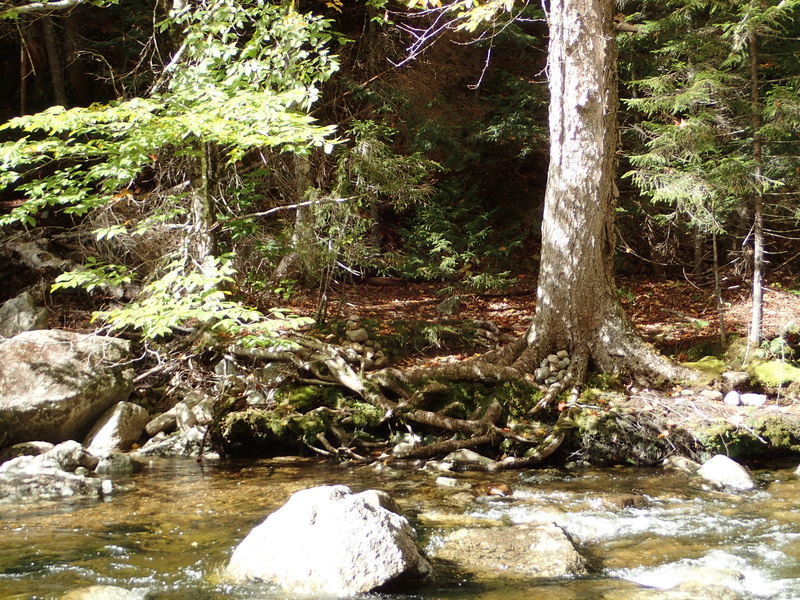 It is a fairly short hike with some enjoyable features (such as the river crossing in my opinion) which do make it somewhat fun. The snowy section of trail near the summit of Street was also a nice touch. All in all it was a great day in the mountains!